Let's get this out of the way right off of the bat: the title image on this article has absolutely no correlation to what the rumored Amazon Kindle phone may look like, it's just an image that we grabbed off of the Internet, because no real images exist. Whether or not you like how the phone in the image looks makes no difference, because, to repeat, the image is not real. All that said, it looks like the rumor mill is swirling around Amazon again, saying that there will be a Kindle phone released sometime in mid-2013.This time the news is coming from the Taiwan Economic News, reporting that Foxconn is building the Kindle phone and aiming for a release in the middle of next year. The report claims that Amazon has designed the phone to hit a $100-200 unit price, which could mean that the phone would be priced on par with the Nexus 4. Word has it that Amazon has ordered 5 million units total. The report also seems to confirm news that we had heard last month from DigiTimes that Amazon had contracted Foxconn to build the Kindle phone. are there too many phone brands already? the market is too saturated already. soon, one by one will start to fall and only the strong will survive! There are a ton of phone manufacturers, but as far as platforms, it's really just Android and iOS that cover most of the market. 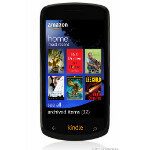 Sure, a Kindle phone would be based on Android, but separate enough to be considered a competitor. I'd like to see more platform competition. iOS vs Android is boring. I'd love to see it be iOS vs Android vs WP vs BB. Any more than that might be too much (sorry Kindle, Firefox, bada, and webOS fans). Yes that would be really exciting to see at least top three or four platforms competing with each other head to head rather than iOS & Android. My friend has already jumped onto the windows phone and I'm looking at blackberry to see if it is worthy enough to switch over from android. But I'm also very interested to see new platforms that are not widely known try to emerge into the market as well. We'll see what happens. I saw Jeff B. at a restuarant, and he was carrying a phone that looked just like that. Just kidding. michael h article, better not disagree with him or you'll get modded and or banned!